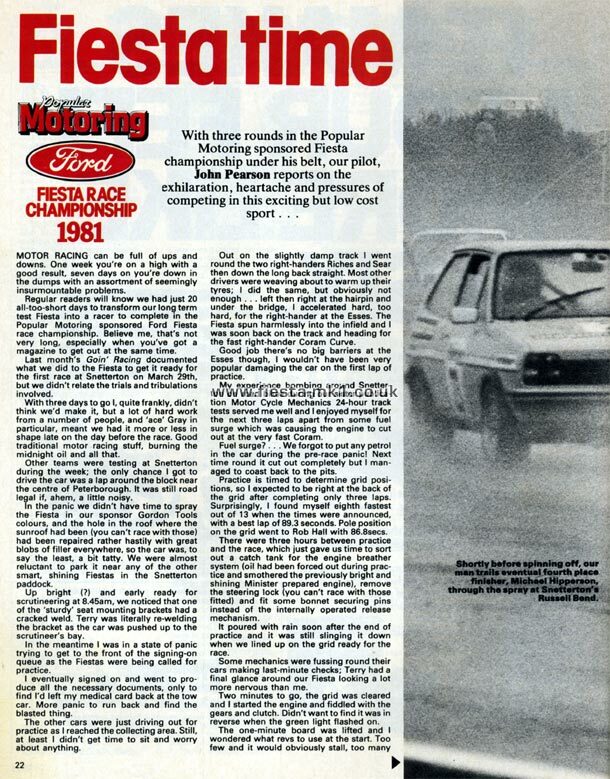 With three rounds in the Popular Motoring sponsored Fiesta championship under his belt, our pilot, John Pearson reports on the exhilaration, heartache and pressures of competing in this exciting but low cost sport. . .
MOTOR RACING can be full of ups and downs. One week you're on a high with a good result, seven days on you're down in the dumps with an assortment of seemingly insurmountable problems. 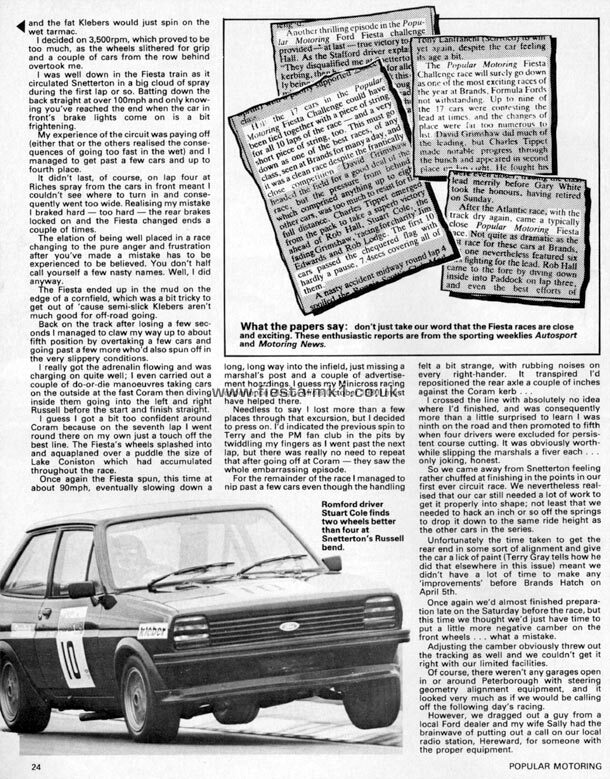 Regular readers will know we had just 20 all-too-short days to transform our long term test Fiesta into a racer to complete in the Popular Motoring sponsored Ford Fiesta race championship. Believe me, that's not very long, especially when you've got a magazine to get out at the same time. 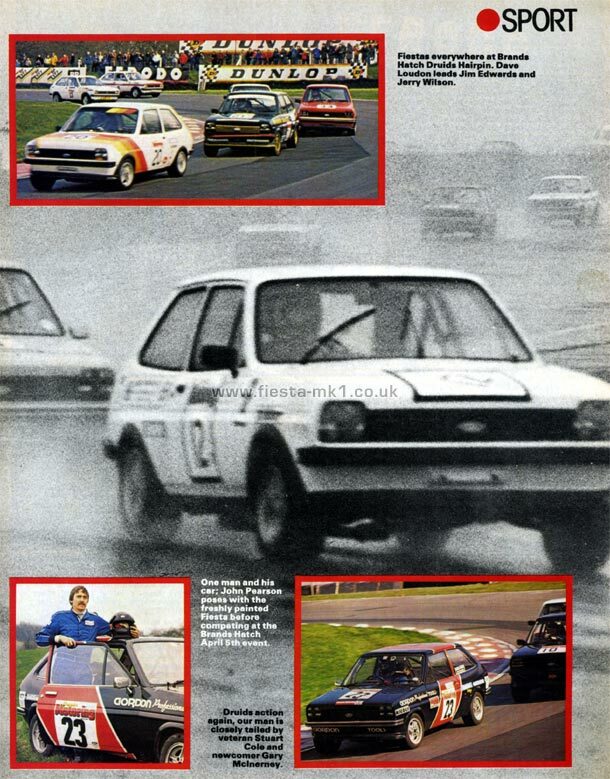 Last month's Gain' Racing documented what we did to the Fiesta to get it ready for the first race at Snetterton on March 29th, but we didn't relate the trials and tribulations involved. With three days to go I, quite frankly, didn't think we'd make it, but a lot of hard work from a number of people, and 'ace' Gray in particular, meant we had it more or less in shape late on the day before the race. 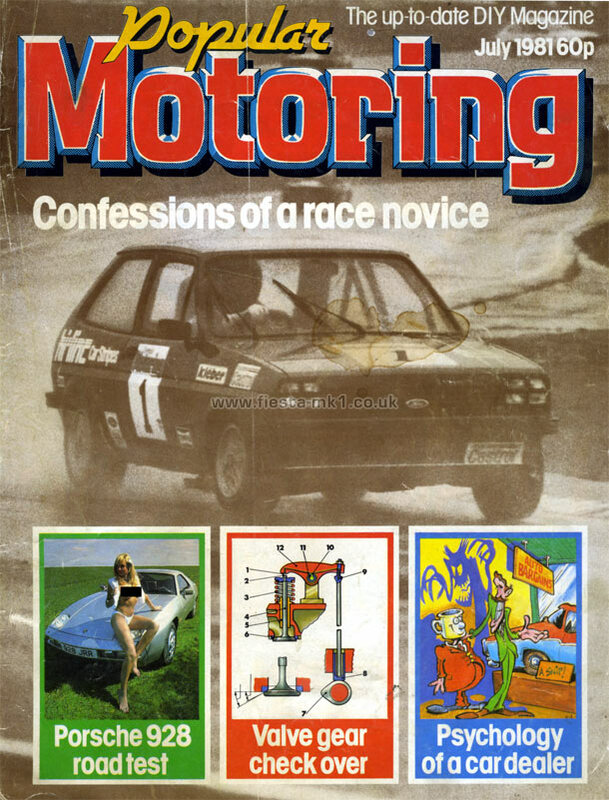 Good traditional motor racing stuff, burning the midnight oil and all that. Other teams were testing at Snetterton during the week; the only chance I got to drive the car was a lap around the block near the centre of Peterborough. It was still road legal if, ahem, a little noisy. In the panic we didn't have time to spray the Fiesta in our sponsor Gordon Tools colours, and the hole in the roof where the sunroof had been (you can't race with those) had been repaired rather hastily with great blobs of filler everywhere, so the car was, to say the least, a bit tatty. We were almost reluctant to park it near any of the other smart, shining Fiestas in the Snetterton paddock. Up bright (?) and early ready for scrutineering at 8.45am, we noticed that one of the 'sturdy' seat mounting brackets had a cracked weld. Terry was literally re-welding the bracket as the car was pushed up to the scrutineer's bay. In the meantime I was in a state of panic trying to get to the front of the signing-on queue as the Fiestas were being called for practice. I eventually signed on and went to produce all the necessary documents, only to find I'd left my medical card back at the tow car. More panic to run back and find the blasted thing. The other cars were just driving out for practice as I reached the collecting area. Still, at least I didn't get time to sit and worry about anything. Out on the slightly damp track I went round the two right-handers Riches and Sear then down the long back straight. Most other drivers were weaving about to warm up their tyres; I did the same, but obviously not enough . . . left then right at the hairpin and under the bridge, I accelerated hard, too hard, for the right-hander at the Esses. 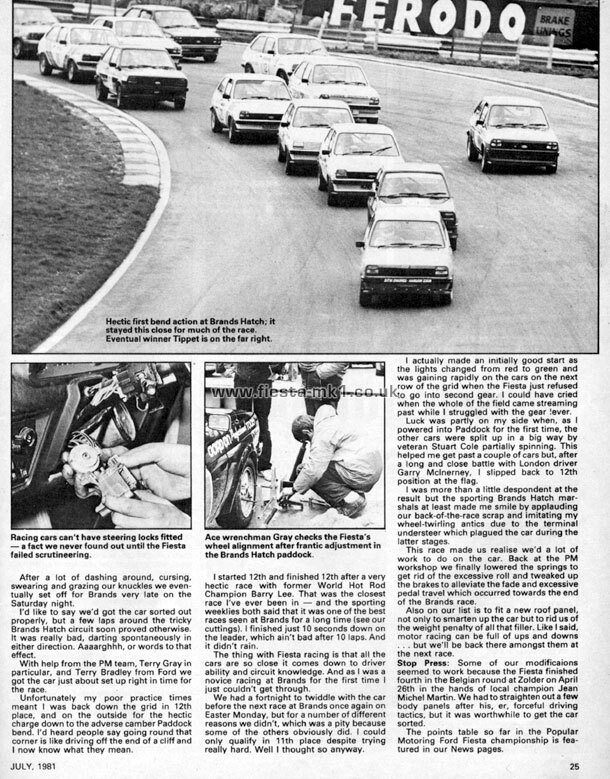 The Fiesta spun harmlessly into the infield and I was soon back on the track and heading for the fast right-hander Coram Curve. Good job there's no big barriers at the Esses though, I wouldn't have been very popular damaging the car on the first lap of practice. My experience bombing around Snetterton on road bikes during our sister publication Motor Cycle Mechanics 24-hour track tests served me well and I enjoyed myself for the next three laps apart from some fuel surge which was causing the engine to cut out at the very fast Coram. Fuel surge? . . . We forgot to put any petrol in the car during the pre-race panic! Next time round it cut out completely but I managed to coast back to the pits. Practice is timed to determine grid positions, so I expected to be right at the back of the grid after completing only three laps. Surprisingly, I found myself eighth fastest out of 13 when the times were announced, with a best lap of 89.3 seconds. Pole position on the grid went to Rob Hall with 86.8secs. There were three hours between practice and the race, which just gave us time to sort out a catch tank for the engine breather system (oil had been forced out during practice and smothered the previously bright and shining Minister prepared engine), remove the steering lock (you can't race with those fitted) and fit some bonnet securing pins instead of the internally operated release mechanism. It poured with rain soon after the end of practice and it was still slinging it down when we lined up on the grid ready for the race. Some mechanics were fussing round their cars making last-minute checks; Terry had a final glance around our Fiesta looking a lot more nervous than me. Two minutes to go, the grid was cleared and I started the engine and fiddled with the gears and clutch. Didn't want to find it was in reverse when the green light flashed on. Bottom-Right - Shortly before spinning off, our man trails eventual fourth place finisher, Michael Hipperson, through the spray at Snetterton's Russell Bond.